Today's hiring of Mick Cronin as UCLA men's basketball coach provides an opportunity to dissect a cold streak in Bruin basketball, namely one national championship in the past 44 years, following a Golden Age of 10 titles in 12 years (1963-64 to 1974-75). Cronin succeeds interim coach Murry Bartow, who succeeded Steve Alford, who was fired this past New Year's Eve. Alford's Bruin teams made the NCAA Sweet Sixteen three times in his five full seasons at the helm, a better record than Cronin's in getting to this round. Developments in Westwood over the past four months naturally raise questions over the state of the program and the demandingness of the fan base. Lurking behind any discussion of UCLA basketball, of course, is the program’s success under the legendary coach John Wooden. It was under Wooden, who ended his 27-year stint on the Bruin bench with the aforementioned 10 national championships in 12 years. The tenth title (in 1974-75) came in particularly dramatic fashion, as Wooden had announced shortly after UCLA’s win in that year’s national semifinal that the upcoming championship game vs. Kentucky would be the last game he would ever coach. The Bruins rarely lost at all in the early 1970s, compiling an 88-game win streak that ended in 1974. Further, a new ESPN.com ranking of all 81 NCAA men's hoops champions in history (the most recent entry being Virginia) placed Wooden-era UCLA teams in the 1st, 3rd, 5th, 6th, 11th, 17th, 18th, 19th, 23rd, and 37th positions. Presumably, few UCLA fans are today clamoring for Bruin coaches to defy reality by winning 10 national titles in 12 years. However, that seemed to be the standard in the mid-late 1970s. Wooden’s immediate successors, with records decidedly better than Alford’s, felt the heat harshly and quickly and left for other gigs. Gene Bartow (father of Murry), the first post-Wooden UCLA coach, went 27-5 and made the Final Four in 1975-76, then went 24-5 in 1976-77. There was no third year in Westwood for Bartow, as he left to become the founding coach of a new program at the University of Alabama-Birmingham. The next coach, former Bruin assistant Gary Cunningham, went 25-3 and 25-5 the next two years (making the Elite Eight in 1978-79), before leaving for a small college in Oregon to launch what became a long career in Division I athletic administration. According to Los Angeles Times reporter Mark Heisler’s 1996 book They Shoot Coaches, Don't They? UCLA and the NCAA Since John Wooden, Cunningham had actually decided after one season to give it up, but secretly told UCLA he would coach one more year to give the school more time to find its next coach. Former UCLA and NBA player Keith Erickson, in his book Champions Again! about the 1994-95 Bruin team, simply noted that Wooden’s immediate successors “were at the wrong place at the wrong time” (p. 66). UCLA has now had 10 head basketball coaches in the 44 seasons since Wooden retired, including the interim skipper Murry Bartow. Only once since Wooden’s retirement has UCLA won a national tile, in 1995 under Jim Harrick. Post-Wooden Bruin teams have appeared in three national championship games (1980, 1995, and 2006) and six Final Fours (1976, 1980, 1995, 2006, 2007, and 2008). 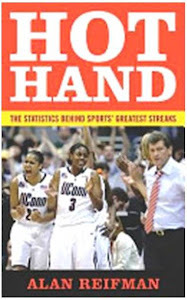 Only one of the 10 coaches, Ben Howland, brought back a sense of sustained success (albeit without a national championship), leading the Bruins to three consecutive Final Four appearances in 2006, 2007, and 2008. The questions concerning the past four decades of UCLA basketball abound. In the following sections, I raise and attempt to answer these questions as best I can. Why hasn’t UCLA produced at a higher level over the past 44 seasons? Could UCLA’s failure to contend for more post-Wooden national championships stem from a lack of coaching talent? One way to evaluate general coaching ability – independent of how a given coach did at UCLA – is to examine his coaching record in other jobs. First, a good coach, given sufficient time to recruit and implement his or her system, should be able to win a sizable majority of games just about anywhere. Second, UCLA offers many competitive advantages in recruitment and resources (e.g., championship legacy, location in a large city, nice campus, good academics), so coaches’ records in their non-UCLA head coaching jobs arguably offer a more accurate picture of their underlying abilities absent these advantages. Of the nine post-Wooden coaches (excluding Murry Bartow), seven held head-coaching jobs at other schools. The following table shows their records. *Excluding 2019 interim coach Murry Bartow. One can safely say that these coaches represented a range of abilities and accomplishments, but some were clearly excellent coaches. Larry Brown, who later won an NCAA title at Kansas and an NBA title with Detroit, would have to be considered among the all-time coaching greats on the court. However, his wanderlust – having coached nine NBA and three college teams – and record of NCAA rules violations detract from his accomplishments. Harrick and Howland, two of UCLA’s better post-Wooden coaches in terms of postseason success, also had various off-the-court problems (Harrick, Howland). The remaining coaches were, to my knowledge, free of scandal. Gene Bartow had an impressive overall record, not only taking UCLA to the Final Four, but also leading Memphis State (now just Memphis) to the 1973 national-title game, where it lost to UCLA. Cunningham showed a lot of promise in his brief coaching stint, but his career interests lie elsewhere. Lavin and Alford were solid, although each enjoyed only modest postseason success (Lavin led one team, UCLA in 1997, to the Elite Eight, whereas no Alford team at any Division I school went beyond the Sweet Sixteen). For the most part, then, the quality of the post-Wooden UCLA coaches was high. Instead, the real problem seems to be instability on the Bruin sideline, both in terms of the frequent turnover of coaches and the off-the-court problems with which some of them were involved. For whatever reason, coaching stints of 20 years or longer at the same school are quite rare today. Within power conferences, only Jim Boeheim, Mike Krzyzewski, and Tom Izzo fit the bill. Someone who was never far from the revolving door of post-Wooden UCLA coaching, but who never actually entered it, was former Bruin assistant Denny Crum. Crum, of course, had left UCLA after the 1971 tournament to begin a 30-year head-coaching run at Louisville that yielded two national titles (1980, over UCLA in the final, and 1986) and six Final Four appearances. According to one source, longtime UCLA athletic director J.D. Morgan disliked Crum and opted for Bartow, who more resembled Wooden in background and personality. Crum claimed to have been offered the UCLA job on three other occasions, but always declined it. Whether Crum could have posted similar numbers as a head coach at UCLA as he did at Louisville, we’ll never know. However, the Bruins’ repeated failure to land Crum in the post-Wooden era could only have magnified Bruin fans’ frustration at the dearth of championships. What about the players UCLA has recruited in the past 43 years? Centers Lew Alcindor (1966-67 to 1968-69; later known as Kareem Abdul-Jabbar) and Bill Walton (1971-72 to 1973-74) led the Bruins to five out of six possible national titles during their varsity playing careers, in an era of freshman ineligibility. That both of these all-time greats completed their respective senior seasons is noteworthy, however, in terms of maintaining a dynasty. How many more NCAA titles would Michigan State have won, for example, if Magic Johnson hadn’t turned pro after his sophomore year? UCLA has had some very good post-Wooden players stay four years – such as Ed O’Bannon, who led the Bruins to the 1995 title -- but many haven’t. And no Bruin player has had quite the impact of Alcindor or Walton. How good has UCLA’s on-court talent been over the past 44 years, relative to that of other schools? The closest current program to the John Wooden-era Bruins, in my view, is Duke. Krzyzewski, with 39 years on the Blue Devils’ bench, gives Duke a similar iconic coaching figure to Wooden. Coach K has won fewer national titles (five) than has Wooden, but has the same number of Final Four appearances (12) as him. Whatever one thinks of this UCLA-Duke comparison, it is safe to say that bringing in Duke’s caliber of players would improve virtually any school’s chances of contending for national championships. 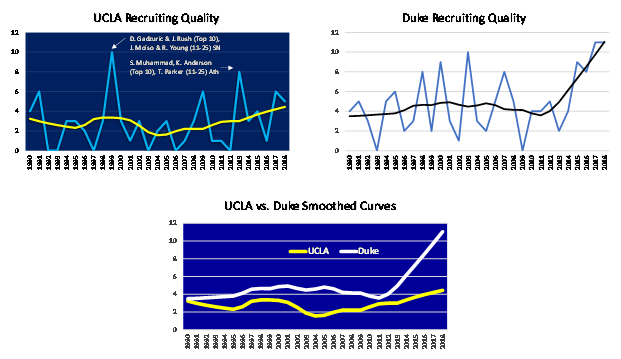 How has UCLA’s talent over the past 43 years compared to Duke’s? Using Sports-Reference.com’s Recruiting Services Consensus Index (RSCI) Rankings (which go back to 1998-99), supplemented by my own personal stack of annual preseason college-basketball magazines (going back to 1989-90), I devised a system to assign an overall yearly recruitment-quality score to UCLA and to Duke. I awarded three points for each Top 10 national recruit a school landed, two points for each recruit ranked 11-25, and one point for each recruit ranked 26-50. As an example, an entering class of two Top 10 players, a player ranked 11-25 and one ranked 26-50 would yield nine points. Results are shown in the three following graphs (which you can click to enlarge). The upper-left graph shows UCLA’s year-to-year recruiting success, going back as far as I had data. The players who entered in the Bruins’ two best recruiting classes are listed in this graph. As is evident, there is a lot of year-to-year fluctuation in quality of recruiting classes (light-blue curve). These ups-and-downs are not necessarily unexpected, as bringing in a large class of top players one year may leave few, if any, available scholarships the next year. To glean more general or “smoothed” trends, I used loess regression (yellow line for UCLA). The upper-right graph presents the same kind of curves for Duke. Finally, the bottom graph compares Duke’s and UCLA’s smoothed curves. Although the magnitude of the difference has varied, the Blue Devils have consistently out-recruited the Bruins over the past 30 years. UCLA’s instability in coaching may well have played a large role here. Does UCLA’s post-Wooden ledger of six Final Four appearances and one national title represent a gross underperformance relative to what could reasonably be expected? Only six schools have more Final Four appearances than UCLA in the post-Wooden era: North Carolina (14), Duke (13; one under Bill Foster in 1978 plus Krzyzewski’s 12), Kentucky (10), Kansas (9), Michigan State (9), and Louisville (7). Michigan is tied with UCLA at 6. Though not making Final Fours at a Woodenesque level, Bruin teams have not exactly been doing badly over the past 44 years. Given UCLA’s six Final Four appearances post-Wooden, is the school’s one national title lower than would be expected? To address this question, I plotted for each school with at least one Final Four appearance from 1976-2019, its number of Final Four appearances (x-axis) against its number of national titles (y-axis). 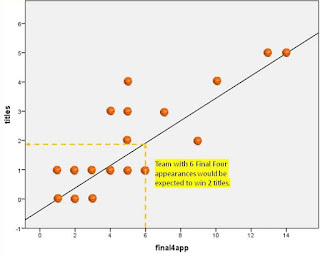 Based on the past 44 years, the best-fit line in the above graph gives us the rough estimate that, for every three appearances in the Final Four, a team should win one national title. 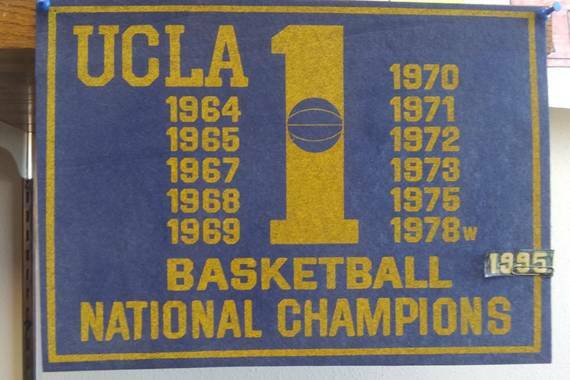 UCLA has made six appearances, so by this standard, the Bruins should have won two national titles. UCLA is therefore underperforming in this sense, but not egregiously so. To what extent were Bruin fans judging Alford like UCLA’s immediate post-Wooden coaches? In retrospect, many Bruin fans will probably find it ridiculous that Gene Bartow, with a 51-10 (.836) record and Final Four appearance at UCLA, felt the need to find a job elsewhere after two years in Westwood. Cunningham, with his 50-8 (.862) record, sincerely seemed to prefer administration over coaching, but with greater fan support at UCLA, he might have stuck around longer. Fans’ harsh judgment of winning coaches who fail to replicate the success of legendary predecessors is not unique to Bruin hoops. Nebraska fired football coaches Frank Solich (58-19, .753, from 1998-2003) and Bo Pelini (67-27, .713, from 2008-2014), after they could not win national championships like former Cornhusker coaches Bob Devaney and Tom Osborne. Alford’s winning percentage at UCLA was .663, well below Bartow’s and Cunningham’s. Yet, Alford received five and one-half years to prove himself. Alford had his critics among the fans throughout his Bruin tenure, but few presumably wanted him out after just two years. In that sense, Alford was not treated as harshly as Bartow and Cunningham. A writer on one website covering UCLA sports argued strenuously that Bruin fans were not unreasonable in their judgment of Alford, but rather they simply felt the program was no longer “relevant” in national college basketball circles and a new coach would be needed to reinstate UCLA to the elite level. In the post-Wooden era, UCLA has shown short bursts of national power (1995, 2006-2008) and, based on Final Four appearances, has still been one of the top programs in the country over the past 44 years. Perennial national contention as in the Wooden years seems a stretch at this point. Making the bursts of success more frequent and longer, and keeping the droughts shorter, is more plausible, but won’t be easy for new coach Cronin at UCLA. With all the changes in the game over the past 40+ years – especially expansion of the tournament field and one-and-done players – does it even make sense to speak of college basketball dynasties? The above analyses and discussion accept the premise that a contemporary college basketball program can succeed, if not at John Wooden’s level, at least at stringing together a few consecutive national championships. In fact, two schools have won back-to-back titles post-Wooden: Duke in 1990-91 and 1991-92, and Florida in 2005-06 and 2006-07. An additional two have won championships in two out of three seasons: Kentucky in 1995-96 and 1997-98 (with an overtime loss in the title game in between) and Villanova in 2015-16 and 2017-18. So yes, stretches of three (or perhaps more) years of consistent national-championship contention are still achievable. These would probably satisfy most of today’s UCLA fans. However, changes in the game over the past four decades make such stretches highly unlikely, in my view. For most of John Wooden’s days at UCLA, there were around two dozen teams in the NCAA tournament field and only one team per conference could get in. In 1970-71, UCLA’s crosstown rival USC finished 24-2 (both losses to UCLA) and was perhaps the second-best team in the country, but did not get in. With many strong teams being excluded from the NCAA field back then, things were certainly easier for those who made the field. As the field grew over the years to its current 68 schools, increasingly large numbers of teams from the power conferences were getting in. If teams get hot in March, it didn’t matter what their regular season record was – Exhibit A being the 2010-11 UConn men, who finished 9th in their conference and still won the national title. In the aforementioned ESPN.com listing of all-time best men's NCAA-championship teams, this UConn squad ranked 59th. The second major change from Wooden’s time is, of course, the one-and-done phenomenon. Quite simply, with the best players nationally going to the NBA after one season, it is very difficult – if not impossible – for most programs to develop the continuity needed for a dynastic run. Kentucky in 2011-12 and Duke in 2014-15 won national titles with frosh-laden teams, but no team has done so since.. Lonzo Ball led UCLA to a 31-5 record and Sweet Sixteen appearance in 2016-17, but left after that one year. In the months leading to Cronin's hiring, my impression was that UCLA fans would want an established head coach with a better NCAA postseason track record than Alford’s, someone who can produce a sustained run of national contention like Howland did, but without the team dynamics spiraling out of control. Cronin is an established head coach, but his NCAA postseason record is not better than Alford's. There's obviously no way to know at this point whether Cronin can lead the Bruins to national contention. Someone with Final Four experience would have been especially coveted, but Cronin lacks this. One reported candidate for the Bruin job, Tennessee's Rick Barnes, took Texas to the Final Four in 2003, but he decided to stick with the Volunteers. In fact, UCLA has only once been able in the post-Wooden era to hire a coach who took a previous school to the Final Four. Gene Bartow. Walton might theoretically have been able to enter the NBA early under the 1971 Spencer Haywood ruling, but he did not. Mostly from the Sporting News, but also from Athlon, Lindy’s, and Street and Smith’s. Vacated appearances (e.g., Louisville in 2012 and 2013) are not removed from these totals. Houston Rockets guard James Harden has set the sports world ablaze as a one-man scoring machine. Wednesday night in New York, Harden scored 61 points, extending his streak of scoring at least 30 points to 21 consecutive contests (game-by-game log). It is the fourth longest such streak in NBA history, with only Wilt Chamberlain recording longer streaks of scoring 30+ points (65, 31, and 25 games). The Rockets host Toronto tonight, as Harden seeks to keep lighting up the scoreboard. Despite all the attention Harden has been getting, one can question the value of his streak for at least three reasons. First, prodigious scoring averages don't necessarily equate to championships. In fact, Wilt didn't start winning titles (in 1966-67 with the Sixers and 1971-72 with the Lakers) until his points per game came down and his shooting percentage went up (perhaps suggesting that he and his coaches became more selective in the shots he would take). Also, do you remember big scorer Carmelo Anthony leading the Nuggets or Knicks to the NBA title? Neither do I. Houston is 15-6 over the 21 games of Harden's 30+ streak (although only 5-5 over its last 10), so it would be hard to argue that the streak was hurting the team. Second, has Harden really elevated his performance -- as the concept of a momentum-based hot hand would require -- or are his high-scoring nights more the product of shot volume than efficiency? With injuries to teammates Chris Paul and Clint Capela, Harden has been launching shots at an unprecedented rate for him. So far this season, Harden has attempted 23.9 shots per game from the floor. Previously, his highest single-season shots-per-game average was 20.1 (in 2017-18). Looking at Harden's three-point attempts and success rate over the past 10 games (from most to least recent), one finds the following: 5-20 (.250), 6-13 (.462), 8-19 (.421), 5-19 (.263), 6-15 (.400), 1-17 (.059), 8-16 (.500), 6-16 (.375), 6-15 (.400), and 5-17 (.294). The statistics are mixed, but I would say volume is playing a large role in Harden's scoring. Further pertaining to Harden's large role in the Rockets' offense, an ESPN.com 5-on-5 discussion asks "Can James Harden possibly keep this up?" This article discusses Harden's high rate of unassisted shots and high usage rate. Third, will it hurt Houston over the long term to have Harden playing as great a number of minutes as he currently is? A FiveThirtyEight article asks "Will James Harden’s Hot Streak Burn Him Out?" This article documents, among other things, that Harden is tied for the lead league in minutes per game at 37; his effective field-goal percentage has declined in the fourth quarter of games over the past three seasons; and teams with one player carrying a heavy usage load tend not to do well in the playoffs. The most recent Sports Illustrated magazine features a lengthy article on Harden and the Rockets. Houston coach Mike D'Antoni is quoted to the effect that he has no choice on playing Harden such heavy minutes. Given the Rockets' slow start to the season, "We gotta win games... We can't... come in eighth [in the Western Conference] and get knocked out in the first round." Of course, Harden's scoring streak may just be an oddity, brought about by the absence of some of the Rockets' leading players. It will be interesting to see what happens when they come back! For a large chunk of the 20th century, Boston had one professional sports team that, despite several close calls, could not win a championship. It had another that couldn't lose in the final round. Once the 21st century rolled around, the city saw a third team dominate its sport. The first team being alluded to is the Red Sox, who famously went without a World Series championship from 1918-2004, losing four World Series -- all in seven games -- during the drought. There were additional pre-World Series heartbreaks for the BoSox, as well, namely losing the American League title by one game to the Yankees in 1949 after dropping games on the last two days of the season in the Bronx*; the blown 14-game lead in the 1978 AL East standings, leading to a one-game playoff for the division title, which went New York's way on a famous homer by "Bucky (Bleeping) Dent"; and a blown four-run lead to the Yankees in Game 7 of the 2003 AL Championship Series (season-by-season log). The second team referenced in the opening paragraph is the Celtics. Led by legendary center Bill Russell, who was there the whole time, and an assortment of other NBA greats who were there either at the front or back end of the Celtics' dynasty, Boston won an amazing 11 NBA titles in the 13 seasons from 1956-57 to 1968-69. The following chart (on which you can click to enlarge) shows the championship years (those with a solid green heading) and the future Hall of Famers on each team. The Celtics were 5-0 in NBA finals decided in seven games and 10-0 in Game 7's adding in pre-final playoff rounds during the 13-year span. ** While winning eight straight NBA titles from 1958-59 to 1965-66, Boston claimed 17 straight playoff series wins. The fortunes of the Red Sox and Celtics have reversed a bit in recent decades. Just this past fall, the Red Sox captured their fourth World Series title in 15 years (2004, 2007, 2013, and 2018). The 2018 BoSox won 108 games in the regular season, beat two 100+ win teams in the AL playoffs (Yankees and Astros), and dispatched the defending NL champion Dodgers in the World Series. In no playoff series this year did Boston lose more than one game. Except for an eight-year stretch of sub-.500 seasons (1993-94 to 2000-01), the Celtics have been pretty good of late. They have made the playoffs in 14 of the previous 17 seasons and won the 2007-08 NBA title. However, the 2008 championship is the Celtics' only one in the past 32 years (season-by-season log). As seen in the preceding paragraphs, the Celtics and Red Sox have won a bunch of titles. And we haven't even gotten to the NFL's New England Patriots (the third team alluded to in the opening paragraph)! The Pats have won five Super Bowls in the past 17 years (2001, 2003, 2004, 2014, 2016) and been in three others since 2000. Despite all of New England's Super Bowl success, however, it may be the one that got away that sticks in fans' minds. In the 2007 season, the Patriots went 16-0, then added two playoff wins to reach the 2008 Super Bowl at 18-0. New England was thus in position to equal -- in concept, if not numerically -- the undefeated regular-season and playoff run of the 1972 Miami Dolphins. *** As is well-known to football fans, however, the New York Giants -- aided by the miracle "helmet catch" in the closing minutes -- pulled off a 17-14 stunner to thwart the Patriots' bid for immortality. A decade later, football observers are still dissecting the 2007 New England team. Beyond Super Bowl metrics, the 2018 New England squad has continued the winning tradition and racked up some impressive regular-season streaks for the franchise. According to an NFL.com article, "In securing their 10th consecutive division title, the Patriots have become the first team in NFL history to earn 10 straight playoff appearances" and "New England also secured its 16th consecutive season with a double-digit win total -- tying the 49ers' mark from 1983-1998" (season-by-season log). The final Boston team among the big four North American pro sports is the NHL's Bruins. The B's (so dubbed for their logo) have won three Stanley Cups in what could be considered the modern era. The Bobby Orr and Phil Esposito-led Bruins captured Cups in 1969-70 and 1971-72. Boston has only hoisted the hardware once since then, 2010-11. Orr, a defenseman whose career was limited by repeated injuries to his left knee, had few superiors when playing at his best. On the advanced statistic of combined offensive and defensive point shares, Orr led the NHL four years straight and five years out of six, between 1969-70 and 1974-75. As a frame of reference, Wayne Gretzky led in this statistic seven straight years from 1980-81 to 1986-87 (list of season leaders). Orr's teammate Esposito put together a streak of six straight years leading the NHL in goals scored (1969-70 to 1974-75). In conclusion, the last 20 years or so have been a good time to be a Boston sports fan, largely driven by the Patriots and Red Sox. The Celtics' run from the mid-1950s to the end of the 1960s is unlikely to be duplicated in the foreseeable future, but even if the C's merely contend for a title or two in the coming years, rooting for Boston's teams will be even more fun. *Prior to 1969, there were no divisions within the American and National Leagues, and no pre-World Series playoff rounds. The team that finished the regular season with the best record in the AL and the team that did likewise in the NL went directly to the World Series. **Looking at all of the Celtics' deciding games during the 13-year span, the team was actually 11-0. Boston beat Cincinnati 3-2 in a best-of-five opening-round series in 1965-66. ***The NFL regular season was only 14 games long in 1972, so the Dolphins ended up 17-0 after the Super Bowl. The 2007 Patriots potentially could have finished 19-0. The Washington Capitals begin play in the Stanley Cup finals tonight, seeking to end a 26-year title drought in the nation's capital within the four major North American sports (football, baseball, basketball, and ice hockey). If the Capitals hoist the Cup, it will be their first time in their 44-year history. The Caps made the finals once before, 20 years ago in 1998, losing to Detroit. The city's NFL team, which arrived in Washington in 1937 after a brief history in Boston, had a nice run in the 1980s and early 90s, winning the Super Bowl after the 1982, 1987, and 1991 seasons. The 1991 football championship (claimed in the 1992 Super Bowl) is the last major sports title won by a team from the nation's capital. Beyond 1991, Washington has made the NFL playoffs only six times, never winning more than one game in any postseason. Going way, way back, Washington captured pre-Super Bowl NFL titles in 1937 and 1942. These moments of triumph were followed a few years later by a 25-year string of playoff absences (1946-1970). On the hardwood, the city's NBA team -- known as the Capital Bullets in 1973-74 after making a short move from Baltimore, the Washington Bullets (1974-1997)* and then Wizards (1997-on) -- has captured only one title, 40 years ago. On the baseball diamond, Washington has been home to three franchises: the current team known as the Nationals (moved to DC in 2005, after playing from 1969-2004 as the Montreal Expos), the organization known since 1972 as the Texas Rangers (who had been the Washington Senators from 1961-1971), and the organization known since 1961 as the Minnesota Twins (previously another incarnation of the Washington Senators, from 1901-1960). So with three franchises, collectively playing roughly 85 seasons in the nation's capital, how many World Series titles does Washington have to show for it? That would be one. Led by legendary pitcher Walter Johnson, the 1924 Senators won it all. There is a famous quote long attached to Washington, DC, inspired by poor play early in the Senators' history: "First in war, first in peace, and last in the American League." A Sports Illustrated article from last October summarizes the city's sports frustrations succinctly: "The sheer number of distressing losses is staggering, especially in recent years, when the Nationals, Wizards and Capitals have all been contenders, at least within their conferences. The Caps and Nats in particular have a penchant for heartbreak, especially in deciding games..."
As the SI article notes, Washington's professional sports futility is not quite as bad, if one includes soccer in the mix: "For some reason, D.C. United is immune to the curse. The MLS side has won four MLS Cups, though not since 2004..."
Also, at the college level, Georgetown University's men's basketball program under Coach John Thompson and star center (and current Georgetown coach) Patrick Ewing made three Final Fours in the four years from 1981-82 to 1984-85, with a national title in 1983-84. Thus, although Washington sports fans have not seen major championships in recent decades, their teams are generally competitive. *The renaming from Bullets to Wizards was prompted by two developments. One was the assassination of Israeli Prime Minister Yitzhak Rabin, a friend of Bullets' owner Abe Pollin, and the other was DC's high rate of gun-related violence at the time. **Worth mentioning, at least as an historical footnote, are the barnstorming Washington Generals, variously described as the "perennial opponents" and "stooges" for the Harlem Globetrotters. As noted on the Generals' Wikipedia page, "While the Globetrotters play tricks and spectacular displays of skill for the crowd, the Generals appear to attempt to play a 'normal' game of basketball... not interfering in the Globetrotters' tricks." The Generals are estimated to have lost over 16,000 times to the Globetrotters and beaten them somewhere between three and six times. ESPN The Magazine has an online article today on the Golden State Warriors' offensive explosiveness. Specifically, the article provides statistics on the Warriors' frequency of going on 10-0 and 15-0 runs, and examines whether there are distinguishing circumstances that seem to presage such runs and any effective strategies for opponents to short-circuit them (spoiler alert: time-outs don't seem to work). Back in 2015-16, I examined the explosiveness of the Warriors (which I defined as scoring 18 or more points in six-minute intervals) and of the eight college teams seeded No. 1 or No. 2 in March Madness (defined as scoring 15 or more points in five-minute intervals). 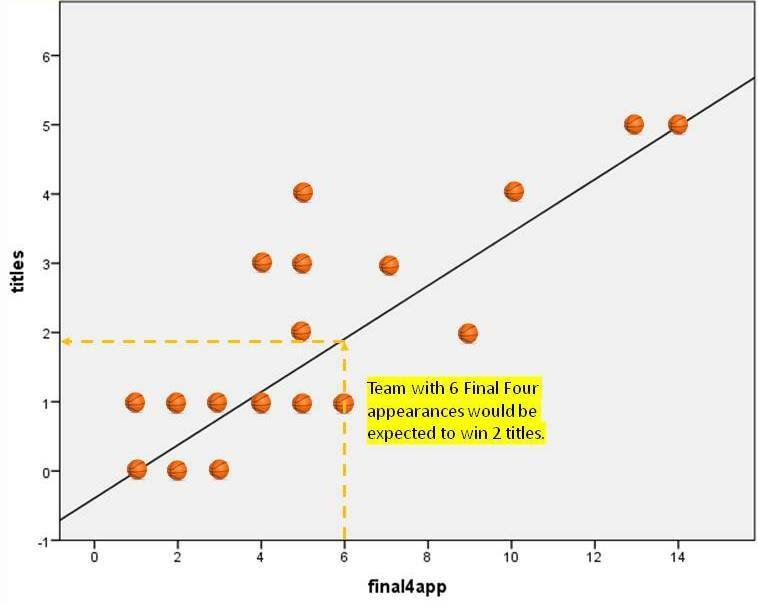 One pattern I found for the Warriors in the final 6:00 of regulation play is that the further they were behind, the greater the offensive bursts they exhibited. The college teams' explosiveness did not seem to predict NCAA-tourney success. Xavier was the most explosive team among the eight I studied by a good margin (13 explosions in its last 10 regular-season games, with no other team higher than nine). The Musketeers also had the fastest tempo (possessions per game) among the eight teams. Despite these seeming advantages, however, Xavier was eliminated in the second round. With Wednesday night's blowout regular-season-ending win over the Milwaukee Bucks, the Philadelphia 76ers set a record for most consecutive wins entering the playoffs (16). 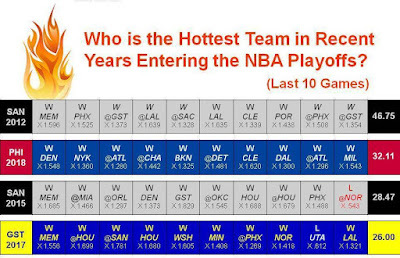 By this measure, the 76ers could lay claim to being the all-time hottest NBA team entering the playoffs. However, by another measure of end-of-season hotness, which I developed in 2015, Philly would not quite be at the top. As shown in the following graphic (which you can click to enlarge), the 2011-12 San Antonio Spurs were the hottest team in recent years entering the NBA playoffs. Note that my method uses only a team's final 10 games of the regular season (to make things comparable among teams), so one could argue that I am not doing justice to the full 16-game length of the Sixers' streak. Also, my measure takes into account the strength of the opposition and it is here, in my view, that Philly suffers. If you win a game, your hotness "temperature" is multiplied by [1 + opponent's winning percentage entering the game]. Thus, when the 2016-17 Golden State Warriors beat the .781 San Antonio Spurs with eight games left in the season, the Warriors' cumulative hotness value after the team's prior game would be multiplied by a hefty 1.781. In finishing out the season, this year's 76ers beat such weak teams as the Atlanta Hawks (twice, when the Hawks' winning percentages were .280 and .296), the Dallas Mavericks (.300), the Brooklyn Nets (.325), and the New York Knicks (.360). As a result, the Sixers' winning streak has included such anemic multipliers as 1.280, 1.296, 1.300, 1.325, and 1.360. Philly's toughest opponent in its last 10 games was Cleveland (.620), thus the Sixers' win over the Cavaliers gave Philly a multiplier of 1.620. Just as my system rewards wins over good teams more than wins over bad teams, it punishes losses to bad teams more severely than losses to good teams. After a loss, a team's previous cumulative temperature is multiplied straight up by the opponent's winning percentage entering the game. If you lose to a .750 team, your temperature to that point is multiplied by .750. If you lose to a .400 team, your temperature is multiplied by .400, which lowers your temperature much more. High hotness by this measure does not necessarily translate into playoff success, so Philadelphia fans should be OK with the fact that their team is not the hottest entering the playoffs in the last few years. Neither the 2011-12 nor 2014-15 editions of the San Antonio Spurs, which finished their respective regular seasons playing at pretty scorching levels, won the NBA championship (note that the 2015 Spurs entered their final game with a temperature of 52.43, but lost to a .543 New Orleans squad, roughly halving the Spurs' temperature to 28.47). The 2016 champion Cavaliers lost four of their final 10 regular-season games, yielding a microscopic temperature of 0.70 (the theoretical minimum would be zero, if a team lost its last 10 games to opponents who were all winless on the season, but no NBA team has ever gone winless). The 2015 champion Warriors were 8-2 over their final 10 games and had a relatively low temperature of 9.76. The 2014 champion Spurs were 6-4 in their final 10 and had a tiny temperature of 1.29. As I noted in my original entry introducing the metric, the formula does not take account of factors such as home/road location of games, margin of victory/loss, or resting of players down the stretch. One could also argue that even a single loss (unless it's against a team playing .800 ball or thereabouts) is excessively influential in depressing a team's temperature. However, among teams who won all 10 of their final regular-season games -- the 2012 Spurs and 2018 Sixers -- I think the temperature metric properly reflects the more difficult opposition San Antonio encountered. I occasionally get asked how I got interested in streaks. There's no way to know for sure, but I suspect that growing up in Los Angeles as a basketball fan in the early 1970s was a factor. This era included both an 88-game winning streak by coach John Wooden's UCLA program and a 33-game roll by the L.A. Lakers. These remain as records for men's college basketball and the NBA, respectively. Following a January 23, 1971 loss to Notre Dame (when I was eight years old), UCLA rattled off 15 straight wins to claim the school's fifth straight NCAA championship. This was not an easy run to the title, as six of the 15 wins were by four points or fewer (see here for UCLA season-by-season logs from that era). The next season, 1971-72, was far easier for the Bruins. Sophomore Bill Walton joined the squad,* leading UCLA to a 30-0 record and another championship. Only two games were closer than 10 points, a five-point win in the NCAA title game vs. Florida State and a six-point conference win at Oregon State. Another 30-0, title season followed in 1972-73. Two six-point conference wins were the Bruins' closest of the season. With seven straight national championships and 75 straight wins, UCLA entered the 1973-74 season, Walton's senior year. Having survived 65-64 against a talented Maryland squad in the season's second game, UCLA ran its season record to 13-0 and overall streak to 88 games, entering the site of its last lost -- Notre Dame -- on January 19, 1974. Having taken a late 70-59 lead over the Irish (with no three-point shot or shot clock), the Bruins seemed almost certain to extend their streak. However, UCLA inexplicably gave up a 12-0 run to close the game (shown here on YouTube), yielding a 71-70 Notre Dame victory. The Bruins' failure to get a tip-in on a final possession is painful from a UCLA perspective. The Bruins' streak of titles also fell that season, as they couldn't hold a seven-point lead in the second overtime period over NC State in the national semifinals. Partially overlapping UCLA's 88-game basketball winning streak in time was the Lakers' 33-game winning stretch (November 5, 1971- January 7, 1972). In 2007, on the 35th anniversary of the Lakers' streak, I wrote a detailed analysis of it, so I won't do so here. This was an old squad, led by aging superstars Jerry West and Wilt Chamberlain, so it would not have seemed a likely candidate for such a long winning streak. The 1971-72 Laker team also won the franchise's first NBA title in Los Angeles (after the Minneapolis Lakers had won championships in 1949, '50, '52, '53, and '54). The Lakers have won several more NBA titles (1979-80, 1981-82, 1984-85, 1986-87, 1987-88, 1999-2000, 2000-01, 2001-02, 2008-09, and 2009-10; season-by-season log). The Lakers' 1986-87 and 1987-88 titles (the second of which had been guaranteed by L.A. coach Pat Riley) were the first back-to-back championships by an NBA team since the Boston Celtics won in 1967-68 and 1968-69 (list of NBA champions). The aforementioned Chamberlain, who played the final five campaigns of his 14-year NBA career with the Lakers, was like a one-man record book (see the chart on page 169 of the league's golden-anniversary volume NBA at 50 for details). What some observers consider most remarkable is that Chamberlain never fouled out of an NBA game. Kareem Abdul-Jabbar, another legendary NBA center who played roughly the final three-quarters of his career with the Lakers (1975-76 to 1988-89), had a few noteworthy streaks himself. On the advanced analytic metric of Player Efficiency Rating (PER), Abdul-Jabbar led the league nine times in an 11-year span (1970-71 through 1980-81). He also once had a streak of 787 consecutive games with 10 points or more. Being such a large city, Los Angeles has a large number of professional teams (especially if one counts nearby Anaheim), along with major universities UCLA and USC. Whereas the Bruins have been a national power in basketball, the Trojans have done likewise in football. From 2003-05, USC won 34 straight on the gridiron, one of the longest winning streaks in college-football history. The Trojans shared the 2003 mythical national championship (i.e., non-playoff determined) and won the mythical championship in 2004 during the streak. It was against Texas in early 2006 (playing for the 2005 mythical title) that USC's winning streak ended. Note that, because of NCAA findings of improper financial assistance to Trojan running back Reggie Bush during this period, some record-keeping organizations have stripped USC of wins and/or titles with which Bush was associated. After winning the World Series in 1988, the Dodgers did not return to the Fall Classic until this past autumn, ending the franchise's 28-year drought (1989-2016) without a National League pennant. However, in falling to the Houston Astros in seven games, the Dodgers extended their stretch without a World Series championship to 29 years. Between 1955, when the Brooklyn Dodgers won the franchise's first world title, and 1988, the team won six World Series (1955, 1959, 1963, 1965, 1981, and 1988), the last five of which in Los Angeles. During this span, there was thus never longer than a 16-year gap between world titles (year-to-year log). Individual Dodger players have had a few interesting streaks during the franchise's L.A. years. Many baseball fans (at least those of a certain age) will be familiar with how Dodger pitcher Orel Hershiser set the MLB record of 59 consecutive scoreless innings in 1988, passing another Dodger, Don Drysdale, who had thrown 58 straight shutout innings 20 years earlier. What I hadn't realized is that yet another Dodger, Zack Greinke, moved into fourth place on the all-time list in 2015 with 45 and 2/3 consecutive scoreless innings (St. Louis's Bob Gibson is in third place with 47 in 1968). Another set of streaks, reflecting the Dodgers' perennially strong farm system, involves consecutive Rookie of the Year winners in the National League. L.A. players won five straight from 1992-1996 (Eric Karros, Mike Piazza, Raul Mondesi, Hideo Nomo, and Todd Hollandsworth) and four straight from 1979-1982 (Rick Sutcliffe, Steve Howe, Fernando Valenzuela, and Steve Sax). Talking about Valenzuela, his "Fernandomania" 1981 season featured a lot of hot pitching. I wrote about Fernandomania on its 30th anniversary in 2011. Finally, continuing on the theme of great Dodger pitchers, Clayton Kershaw led the National League in low Earned Run Average four straight years (2011-2014), whereas Sandy Koufax did so five straight years (1962-1966). If one wants to take literally the name Los Angeles Angels, even though the team plays in Anaheim, then I would include two players' individual streaks in the present essay. Mike Trout has recorded at least 7 offensive Wins Above Replacement (oWAR) for each of the last six seasons. In order to find streaks matching or exceeding Trout's, you need to look at players such as Willie Mays (nine straight years, 1957-1965), Babe Ruth (seven straight, 1926-1932), and Ted Williams (six straight, 1941-1942, 1946-1949, interrupted by military service). In terms of Angel pitching, it would be hard to top Nolan Ryan's eight years with the club (1972-1979). Ryan had a stretch of five years out of six with 300-plus strikeouts per year (1972, '73, '74, '76, and '77). He also had some career milestones in 1975, but suffered through elbow pain that year and eventually had surgery. Only Ryan and Randy Johnson (each with six) have more than three career 300-plus strikeout seasons. Johnson had a streak of five straight 300-plus strikeout seasons (1998-2002; be sure to look at the 1998 TOTAL line in his season-by-season log, as he pitched for two teams that year). Pro football has had an inconsistent history in the L.A. area, with the Rams (1946-1994**; 2016-present) now in their second stint there, the Chargers (1960, 2017) likewise in their second (brief) stint in L.A., and the Raiders a resident from 1982-1994. Given the Rams' longest history in L.A., I focus on them. The L.A. Rams won the 1951 (pre-Super Bowl) NFL championship, amidst a string of four straight divisional titles (1949-1952). Several years later, however, the franchise entered a tailspin, with the Rams finishing either fifth, sixth, or seventh in their division for seven straight seasons (1959-1965). Things turned around again in 1973, with the Rams winning their division seven straight years (1973-1979), culminating in the franchise's only Super Bowl appearance as the L.A. Rams, a loss to the Pittsburgh Steelers on January 20, 1980. From 1991-1994, it was another slide for the Rams, as they finished last in their four-team division for four straight years. With that, the team was off for St. Louis. Two L. A. Ram stalwarts, in terms of longevity, were defensive tackle Merlin Olsen with 198 consecutive starts (1962-1976) and defensive end Jack Youngblood with 184 (1972-1984). The L.A. Kings entered the NHL in the 1967-68 western expansion. An interesting piece of Kings trivia is that the franchise has won more Stanley Cups (two, 2011-12 and 2013-14) than divisional titles (one, 1990-91). The Anaheim Ducks (originally known as the Mighty Ducks) won the Stanley Cup in 2007 and lost in the finals in 2003. Goalie Jean-Sebastien Giguere was part of both teams, but was a truly dominant, hot goalie in 2003, at one point amassing three straight shutouts in one playoff series. In more recent years, the Ducks have faced nothing but playoff frustration, getting eliminated in decisive seventh games four straight years (2013, '14, '15, and '16). It is probably small consolation that their 2017 playoff ouster came in a six-game series. The L.A. Galaxy has been among the most successful franchises in Major League Soccer, winning five championships total, and three in a four-year span (2011, 2012, and 2014). *Walton was a freshman in 1970-71, but first-year players were not eligible to play varsity sports until 1972-73. **The Rams moved from the Los Angeles Coliseum to the previously baseball-only Anaheim Stadium in 1980 and played there through 1994. To increase seating capacity for the Rams, Anaheim added double-decker stands in the baseball outfield area. After the Rams' departure to St. Louis, the outfield seats were removed, giving the Angels' ballpark a more traditional baseball feel once again. ***Don't get me wrong -- a lot of great players would love to have a 13.2 OPS for a season. It's just low relative to Gretzky's previous numbers.